One of the best ways to let viewers know you are going live is with a Steam group. If you’re a Twitch streamer, a small popup appears to all your followers when you go live. But often it appears delayed or sometimes not at all. In addition, it will only appear if the follower happens to be on Twitch. A Steam group can allow you to send out a notification to everyone in your group whether they are online on Steam or not. This is a great way to let your community know when you are going live and with what game. Be careful not to spam it though, as it can interrupt people in-game and get annoying quickly. You can also utilize the Steam group to post announcements about your stream and encourage your community to find fellow gamers to play with. Want an easy way to have your viewers join you in a game? 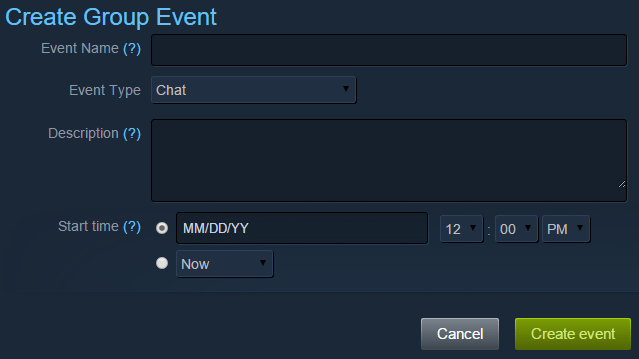 Enter your Steam group chat where they can then hop into your game by right-clicking your name and pressing “Join Game” (if it’s possible). If for some reason Twitch (or whichever streaming site you use) chat dies while you’re streaming, you can use the Steam group chat as a backup to continue interacting with your viewers. Visit the Groups page by hovering over the tab with your username and selecting “Groups”. Enter in information such as the name of your community or channel name. The name and URL should be recognizable to your community. Make sure the group is set to Public so your viewers can join without an invitation. Add your avatar and links to your stream and other social media profiles. Make a !steam bot command with your link and add it to your other social media links in the panels beneath your stream. Okay, now you’ve got people in your Steam group, let’s let them know your stream has started. Go to the Events tab in your Steam group. Include the link to your stream in the name so people are reminded where to go! You can ignore Event Type and Description. Change the Start Date to “Now” and send it!